Dolls: 1 entered- 2nd place- "Timber Ann"
Wyatt's Lego Car Entry: First place! So, while I am disappointed with the quilts, I am super happy with all the other entries! Plus, the fair is fun to enter no matter if you win or lose. I'm already plotting for next year and thinking of all the other produce I could enter! We'll take a day off from the fair tomorrow and then head back on Saturday when Gavin can join us. Plus the Rodeo is Saturday at 4pm. Can't miss that! I promise, this time I will take pictures to share! I really like the baby quilt and had some issues listing it in my Etsy shop...I wanted to keep it! I currently have 3 new quilts that I am working on along with about 4 on the back burner of my mind just waiting to be started. 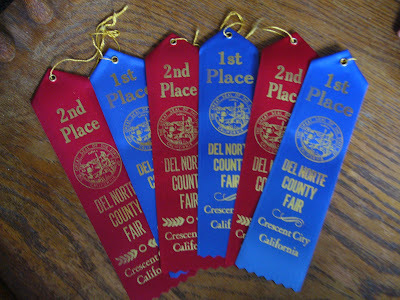 This Thursday (tomorrow) marks the start of our county fair. 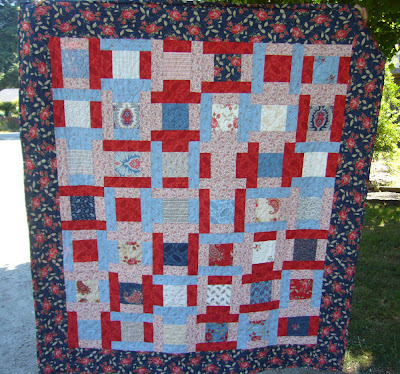 I have 3 quilts entered along with some other non-quilt entries such as jams and produce. I can't wait to see how everything was judged! 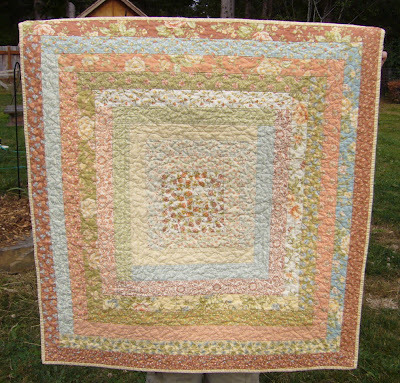 My Kansas Troubles Quilt (as some of you know as "Scrap Happy") received an honorable mention at the 2008 California State Fair. After I receive the ribbon for that quilt I'll take a photo to share. I wish that I had the time to make a trip down to the state fair this year to see all of the marvelous quilts and other exhibits. Oh well, maybe next year. 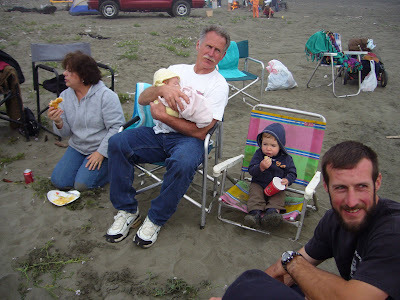 It's not that I don't love camping and love my family, it's that ever since I've had babies camping has taken on a whole new meaning. And it ain't no picnic! I will be sleeping every night for the next week with Wiggler (aka Layton) and Wakes Every 2 Hours to Nurse (aka Timber) on either side of me. I'll be sandwiched in between. The trip will be great for Gavin though to get away from work and fun for Wyatt who will be riding dirt bikes all day long. So, I'm going to try and not be so pessimistic and pray for the best! I'll post pictures when we return! 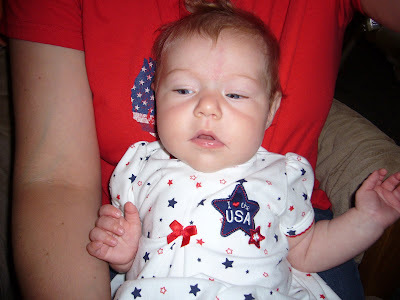 We had a super 4th of July! I thought I'd share some photos from the day. Timber is ready for the parade! 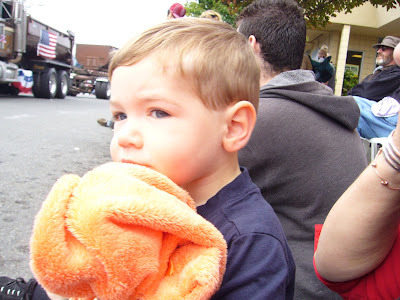 All the sirens were a bit scary so Layton held onto Timber's blanket! Hey! There's our church's float! YAY! 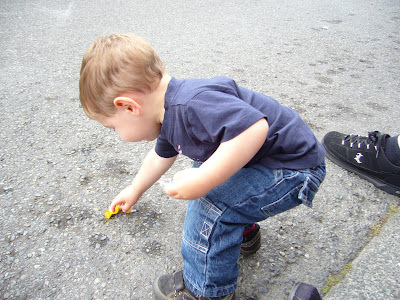 Layton picking up the candy that the parade participants throw out to the kids. 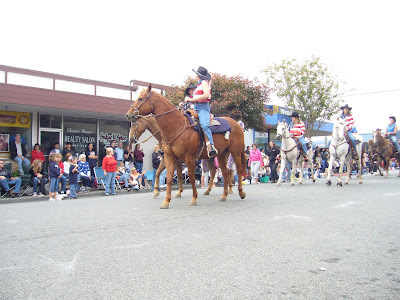 Stitch, my used to be horse, was in the parade too! At Beacon Burger after the parade. 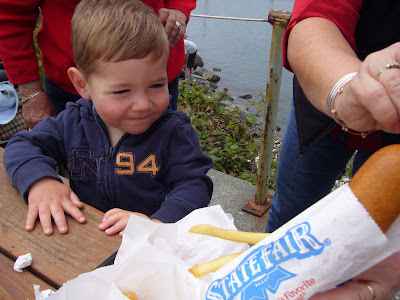 Layton has never eaten a corn dog but he sure looks like he wants to in this picture! Sorry kid, you get the grilled cheese. Later that day at the beach getting ready to watch fireworks! Yes, we have fog. Lots of fog. 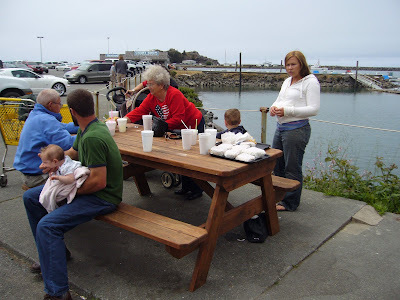 Welcome to Crescent City in the summer! 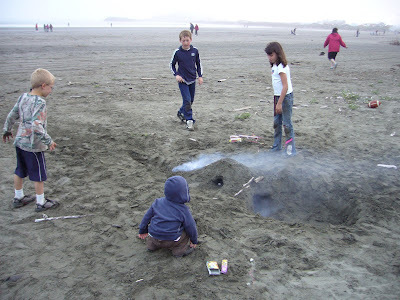 The kids built sand tunnels and set off fireworks inside of them. Then they laughed and laughed as if it were the greatest idea anyone has ever had. 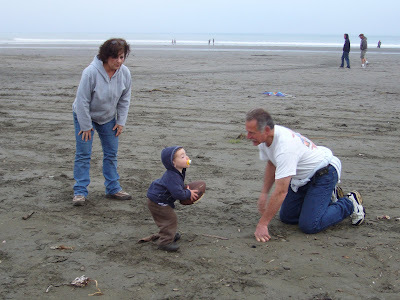 The little bruiser plays football with Nana and Papa. 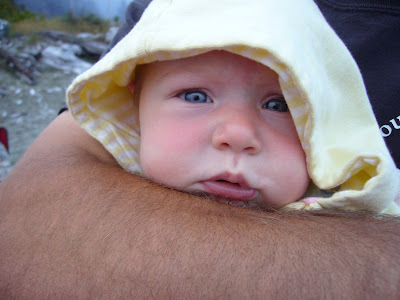 And there's Timber, all snuggled into Gavin's arm. 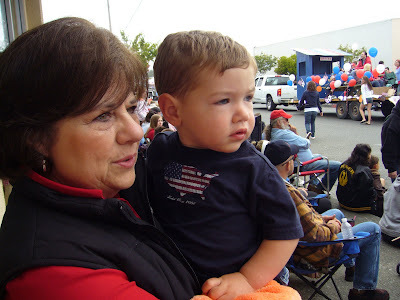 Hope that you and your family had as much fun on the 4th as we did! I hope that your day today is filled with great stuff! We're off to the parade this morning. 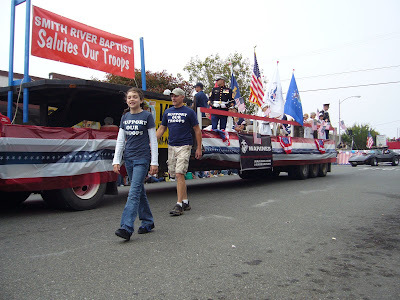 My 10 year old is on our church's float, honoring our troops! Fun! Layton I'm sure will be saying, "Ck, ck" the whole time, referring to the trucks (fire, semi, pick-ups, etc.) going down the parade route. Timber really dislikes loud noises so it will be interesting to see how she does. 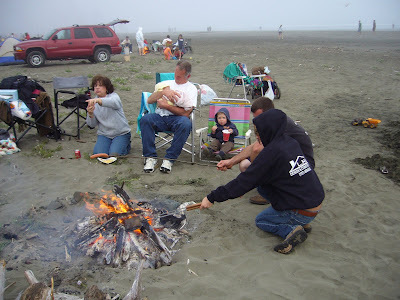 After the parade we'll go to the park and get some yummy grub and then head to the beach later tonight to cook hot dogs (organic, non-nitrate filled ones) over a bon-fire and watch fireworks. 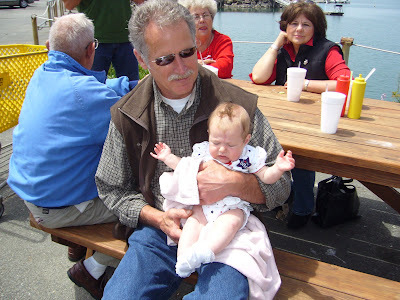 I woke up this morning to find that a fellow Etsian had featured me on her blog! Too cool! That made my morning! It's going to be a SUPER 4th!